Welcome to our Yesterday's Pups page! Are you interested in what your pup's or dog's litter mates are doing now? Do you want to see how they look or find out how they act? Then you've come to the right place! 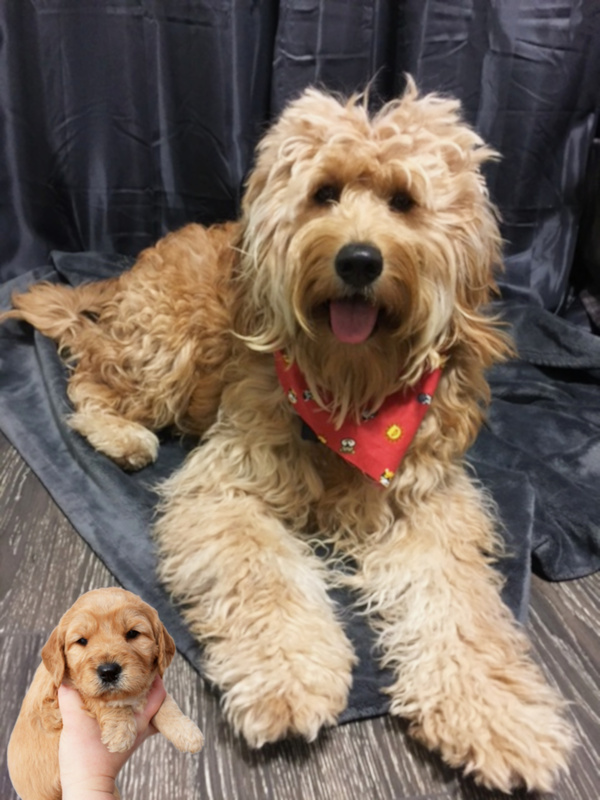 You may also want to see some of our Goldendoodle pups from previous litters on the Yesterday's Goldendoodle Pups page or you can find Doodle pups on the Yesterday's Doodle Pups page. 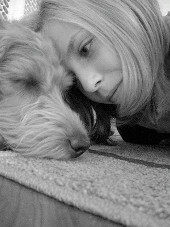 Stella (F1 Goldendoodle), and inset as Gift at 4 weeks, from Becca's and Brixx' January 2010 litter. 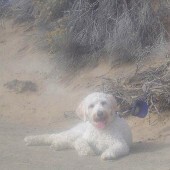 Today is the 9th birthday of the golden doodle we got from you (from Brixx and Becca) and I wanted you to know what a complete delight Stella has been. 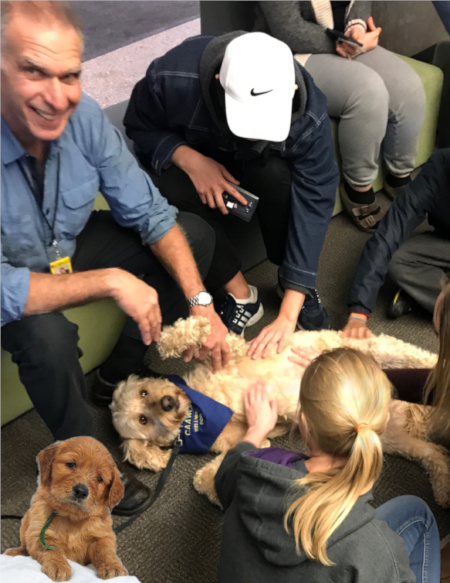 For the last 5 years she's been a certified "wellness" dog, relieving stress at Edmonton's universities, schools, corporate events and the Norwood hospice. Here is a picture of her in action. Thanks for your excellent breeding work. LassieLou (F1 Goldendoodle), and inset as Lassie at 4 weeks, from Beth's and Kodiak's August 2010 litter. "Who says you canâ€™t teach an old dog new tricks?" I thought I would share a few photos of Lassie at work with me. After she passed her Therapy Dog training with CAAWLS (Chimo Animal Assisted Wellness Learning Society) she now accompanies me 1-3 times a week to the Special Needs class I work in. The kids love reading to her, taking her for walks, and cuddling. 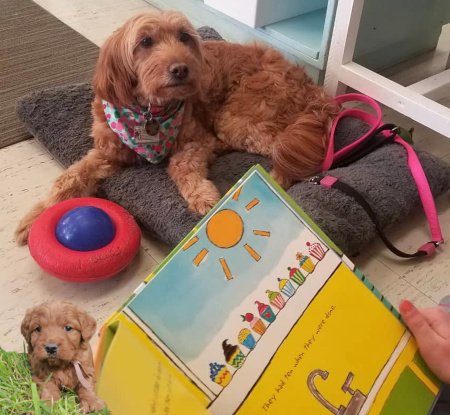 We have a certain time of day where they choose how they want to read (it can be listening to a story online, reading out loud, or reading to someone), but 9 times out of 10 they choose "read to someone" and that someone is always Lassie. She truly is a blessing to our family and to many kids at school! 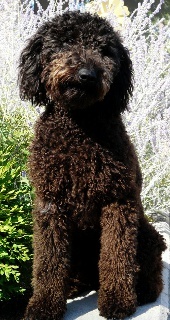 Joey (F1 Goldendoodle), at 14 years from KD's and Dayo's December 2004 litter, inset with a big head, from a previous Yesterday's Pups post. Seasons Greetings!! We've been bragging about Joeyâ€™s age to anyone we meet on our daily walks. Mind you, they're a little slower (despacito style) but he's still a willing participant. Joey has no major heath issues but his eyes are really cloudy and navigates very carefully when entering vehicles and using stairs. He still performs the odd "zoomies" and grabs toys to initiate play time. Bottom line, he is doing great at 98. I hope this note finds you and your family well. Bushel (mini F1B Goldendoodle), inset bottom left at 4 weeks, from Lorelie's and Rusty's June 2009 litter, and, Millie (mini F1B Goldendoodle), inset bottom right as Pal at 4 weeks, from Josey's and Ryder's August 2011 litter. Hope youâ€™re well!! I saw you're on Instagram now so it inspired me to send in a pic! Bushel (in the back of the pic): He's the cuddliest dog ever! And afraid of pretty much everything. He's also a total Mama's boy, I swear he counts down the seconds till she's back home. Look at his pup pictures on the website, he looks a lot like his mom! He loves walks, opening the closet door where we keep the dog food, and sleeping till noon. Millie: She doesn't love the cuddles so much but is always down to play. She's feisty as ever and definitely bosses Bushel around. I remember she was such a quick adoption -- saw her on the website on Friday and she was home with us on the Sunday! She loves long sleeve t-shirts she can pull on, Cheerios, and waking us up early when she wants to play. 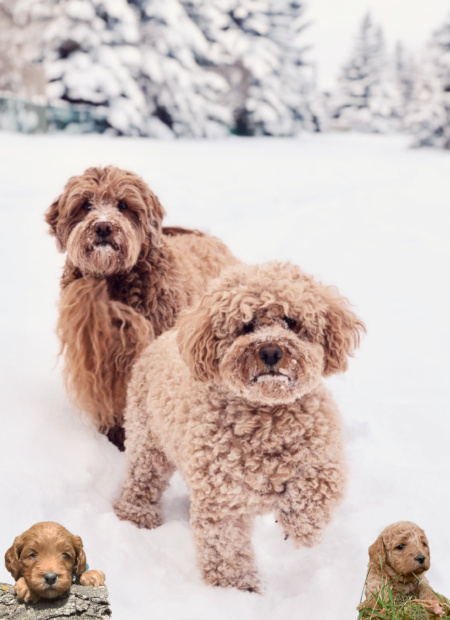 Churro (F1 Goldendoodle), and inset as Rose (with Everett) at 4 weeks, from Tess' and Winter's November 2016 litter. How are you and your family doing? I hope all is well and you are enjoying the turn of the season! Brr itâ€™s a chilly one today! Well, if you remember us, we are the family that took Rose (name changed to Churro). She is not quite at a year as of yet, but she has grown!! 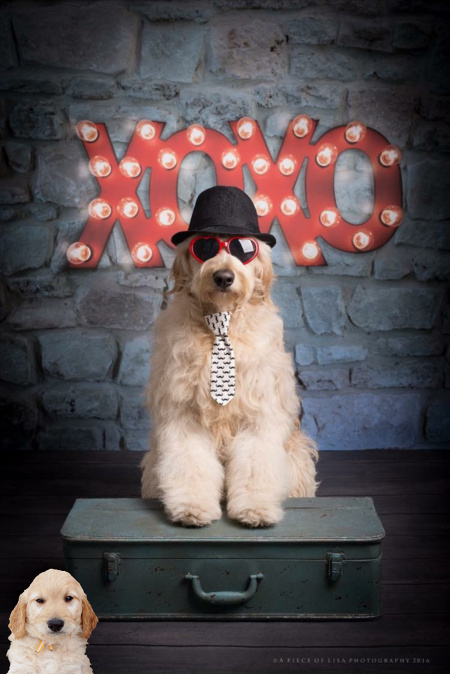 She is the largest doodle at her doggy daycare and every day people are amazed at her size and beauty. Last time I had her weighed was about a month ago and she was at 60 pounds. She has grown since then. I am constantly being asked where she came from and she always receives compliments on her temperament. She has grown into a calm, sweet, silly, yet tricky, adolescent. She is the best dog! She is so sweet and loving. Her favourite things in the world are belly rubs, swimming, bully sticks, and socks... she has gotten over 50 socks since we brought her home, and destroyed them! I honestly donâ€™t even know how she finds them! We have had to put laundry basket lids on every basket in the house. She has been known to even open up backpacks because of a rogue sock inside. I donâ€™t know how she does it. It has become one of her quirks! She continues to come to work with me every day, except one day a week she attends Doggie Daycare to play and run off some energy. We go to the dog park in the mornings and the kids walk her at night. 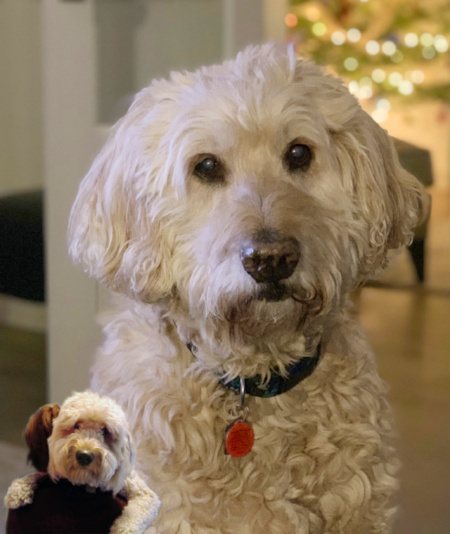 Churro is also somewhat "instafamous" as she has her own Instagram account with over 200 followers, @churro_the_doodle. You were 100% correct in the issues that we would have with her. She has kept us on our toes and is incredibly smart. She always tries to take advantage of the weakest link and she struggled a bit with "mouthing" at first. Every once in a while she does revert back to that, but it is a quick correction. Once we taught the youngest one in the family to be more dominant with her, she fell right in line. But still to this day, when a "new" person comes along, she is up trying to jump on them and forgets her manners. She has been referred to as a "horse", and indeed, my youngest daughter is allowed (by Churro) to climb on and go for a ride. 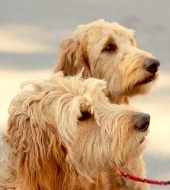 Stella (F1 Goldendoodle), and inset as Camaro at 4 weeks, from Chevy's and Horton's October 2015 litter. I can't believe it's been a year already! It's hard to believe this time last year we were just looking at photos on your website, and now we are home with Stella. It's been an awesome year with her. She has a great outgoing personality and is unbelievably happy and friendly. It's hard to believe but she has become even more social than she was in your initial videos when we chose her. Stella is incredibly smart and we have enjoyed doing extensive training classes with her. She is happier when we have something new to work on, so we have been in classes for a few months straight now. Once we finish the next two classes, we are planning on enrolling in rally obedience with her. I think she will really enjoy it! As for how she grew up, we can't get over how much she has grown! When we took her home she was roughly seven pounds. Now, she is 65lbs! We couldn't be happier with her size, and were very pleasantly surprised when her hair turned red and curlier about six months in. I would call her a light to moderate shedder. As for energy, she is definitely a 7/10 like you said. She is easy to manage though with a combo of two short walks and four mini training sessions every day. We have also started to introduce some group play sessions and dog daycare to increase her socialization. We honestly can't imagine life without her. We take her everywhere, and enjoy her thoroughly. She is sweet and friendly and affectionate. Most of our time is now spent playing with her and taking her places. Her favourite thing in the whole world is water. Stella recently learned how to close the drain in our bath tub, and will commonly sit in there hoping that someone will fill it up. Needless to say, she has really enjoyed the lake this summer. She really is the perfect addition to our family. I've attached a ton of photos (sorry I couldn't decide!) 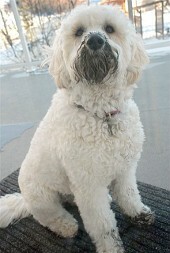 to show how much she has grown, and how much she enjoys mud (is this a goldendoodle thing?). We wanted to say thank you again. Stella is perfect, and we think it's a testament to how great your breeding program is. 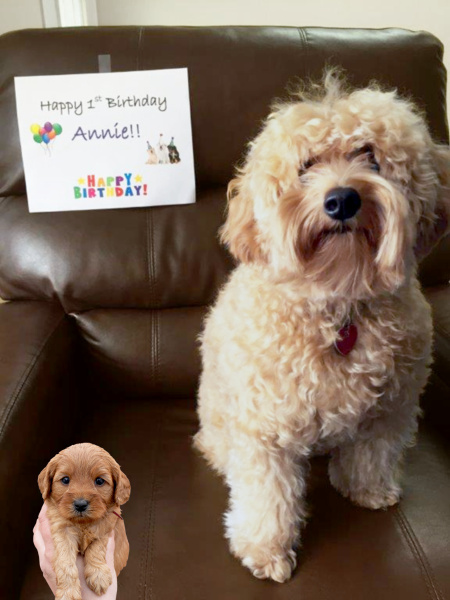 Annie, "Anniversary", (F1B medium Goldendoodle), inset as Annie at 4 weeks, from Ginger's and Ryder's October 2015 litter. I hope you are doing well! It's hard to believe that our sweet little Annie is about to have her first birthday. Boy, that year went by quickly! As you may remember, Anniversary aka "Annie", was born last October (to Mom Ginger and Dad Ryder). She was the smallest one of the litter. As of today, she weighs 15 pounds; she is exactly the size that we were hoping she would be. She also has the personality that we were hoping for -- she is gentle, full of life, smart, cuddly, sweet, faithful and very easy going. 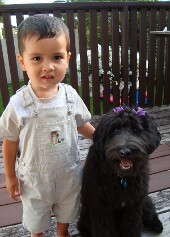 She is a joy in our family; she is fantastic with our kids (who are almost 3 and 6). We all love her to bits!! Her hair is beautiful -- it's soft and easy to comb through; she does not shed at all. I have attached a few photos to this email so you can see what she looks like. Unfortunately, her hair is quite long around her eyes right now -- we need to trim it a bit. She had a bath this morning so we decided to do her "birthday" photo today (a few days early). She still enjoys being in her crate. Just recently, we started to leave her crate door open at night time and she quickly learned that this means that she can cuddle on our bed with us (which of course, we were thrilled with!!!). 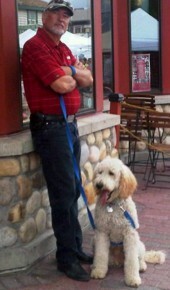 She attracts attention whenever we go -- people are always asking what kind of dog she is and who the breeder is. We have shared your information with many people over the last several months. 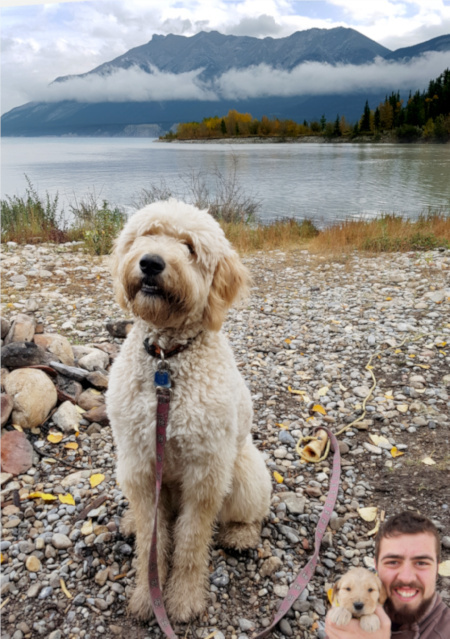 She thoroughly enjoys being around us and as much as possible, we take her with us wherever we go. She loves going to my parents' cabin where she has the freedom to run free... it's a dog's paradise there. As I type this, she is cuddled up beside Brian on the couch -- her favourite place to be. She would cuddle all day long if we let her! Thank you so much for breeding such a fantastic dog! Penny (F1 mini/medium Goldendoodle), inset as Waikiki at 4 weeks, from Montana's and Ryder's April 2015 litter. 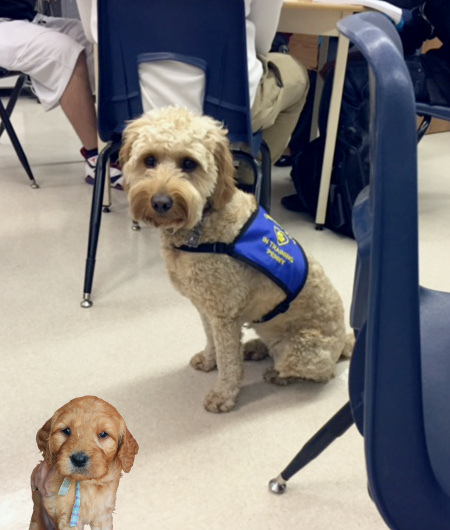 Penny is especially helpful with our students who struggle with severe anxiety. She's surprisingly intuitive and seems to just know when they need her. I'm working on setting up her therapy assessment with St. John's ambulance for early this winter, and the kids love taking part in her training! 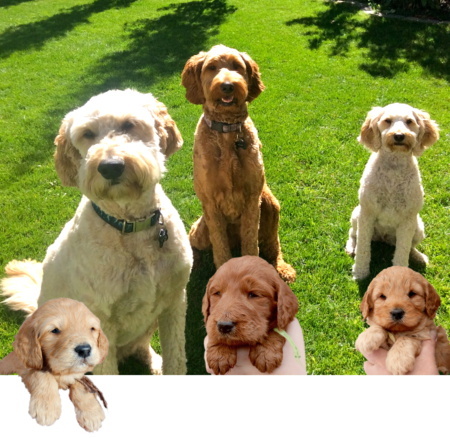 Timber (F1 standard Goldendoodle), inset (left) as Bob at 4 weeks, from Kindle's and Brixx' November 2012 litter, Skye (F1 standard Goldendoodle), inset (centre) as Apple at 4 weeks, from Shae's and Brixx' January 2015 litter, and Rosie (F1B medium Goldendoodle), inset (right) as Shirley at 4 weeks, from Ginger's and Horton's October 2013 litter. Timber is a 75 lb rock star! He has excelled in several obedience, agility and scent training courses. As well, we have been told that he is often used to help in the training of new recruits and puppies at the daycare he attends because of his well-mannered, laid-back and confident personality. We affectionately refer to Timber as an "old soul" but he definitely has a goofy side as well and likes to make us laugh. His favorite activities are playing fetch (on land or in water), lounging in his la-z-boy chair, and spending quality time with his family. Skye is a 55 lb firecracker with a tall, thin and athletic build. Despite being somewhat shy in nature, she has a real enthusiasm for life. Skye is very smart, mischievous and playful. Her favorite activities are running, swimming and playing with Timber. But at the end of the day, when all her energy is finally burnt, she is quite content to lay down and receive endless snuggles. Rosie is 30 lbs of sweetness. She is shy around new people & dogs, but loves to play or cuddle up with those she knows. She is very smart, calm, obedient and loyal. She loves her daily walks & runs, playing fetch and wrestling with my boys. Her quiet time is spent cuddled into a blanket on one of the kids' beds. She has become an important part of our family. Thank you for providing us with such awesome family members! Farley Williams (F1 standard Goldendoodle), inset as Allan at 7 weeks, from Molly's and Dayo's December 2014 litter. Getting set up for mini sessions is always a fun task. I will sit in front of the drops for hours, testing out different props, fabrics, and lighting techniques (true story...OCD bad right here!) until I get what I need. Love this guy to the moon and back. Now if I could only get my Delillah Lou to cooperate, lol!! This page will continue to grow and change over time. It's the place where you can come to find out about not only the beginnings of a pup's life but also where you can keep up-to-date on what's going on with them now. Do you have one of our dogs or pups? Please send us photos! If your photo includes a person we also need a signed Release Agreement. To view and print the Release Agreement you'll need Adobe Reader. Click on the icon to the right to install it if you don't already have it installed on your computer. Please print and fill out the form completely, then fax or mail it to us. If you have problems seeing any content on this page you may want to try Firefox or Google Chrome as your web browser. Zeke's first Christmas -- are all of these presents mine? ?